The Aristocrat slot machine Pompeii is a real favorite in casinos in the US and beyond. The enduring story of the ancient Roman city buried in lava from the eruption of Mount Vesuvius in 79 AD is mildly depicted in this game. Chariots, Roman helmets, gold coins and the eponymous erupting volcano are all symbols on the reels. Aristocrat's Pompeii slot has a great mix of big wins in both normal play and the free spins bonus. That is not to say that it pays all the time and does have a tendency to blow hot and cold in my experience. 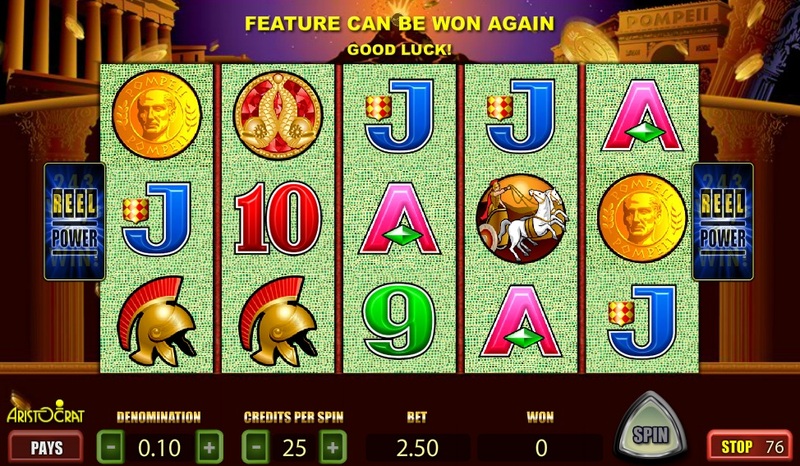 As part of a migration online, Aristocrat have released Pompeii slot through a limited number of gaming sites. 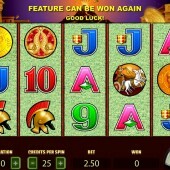 Pompeii is part of the Reel Power series from Aristocrat, just like the popular Choy Sun Doa slot. This means there are more winning line opportunities, 243 to be precise. The wild symbol is a volcano, presumably Mount Vesuvius, which buried Pompeii in lava in AD 79. This appears on the second reel multiplying wins by 3x and on the fourth reel multiplying wins by 5x. If you get both on a winning line the you get a multiplier of 15x. Anyone that has played Aristocrat’s Buffalo slot will know how effective this can be at making big wins. The free spins bonus in Pompeii is triggered by the Pompeii gold coin Scatter appearing on adjacent reels from the left most reel. You need three or more to activate the bonus, but the kicker is that the Wild substitutes as a Scatter. You are rewarded with 10, 15 or 20 free spins depending on how many Scatters you have landed. This feature can re-trigger during the free spins round and it does have a tendency to do so regularly. Pompeii slot is a very entertaining slot, which has paid out some big wins to players over the years. Be aware though that it can have some mean spells, so sometimes you have to catch it right to really get the most out of it. If you prefer your wins to come more frequently then you might want to consider a slot like the Aztec-themed Sun and Moon, which is lower volatility slot. Those that prefer the bigger rewards might be a little more tempted to the erupting volcano's in Pompeii.